The number of jobsavailable for lawyers over the next 10 years will grow at an average rate, but even with a growth rate of 9% in that time, competition for open positions will be stiff. Each year, significantly more students graduate from law school than there are jobs available. This means you need to go above and beyond to earn the interest of respectable recruiters. The first step to that is to create a winning resume. Our lawyer resume templates are an excellent stepping stone to creating your own standout document. Use them in conjunction with the writing tips to help you get your foot in the door for an interview. Why Use Lawyer Resume Templates? While most jobseekers create resumes that provide information in reverse chronological order, some find this doesn't best meet their needs. An alternative format is the functional resume template. Functional resumes are an excellent choice for people who have gaps in their work history, are changing careers, or have yet to gain any experience at the professional level. These resumes focus on your skills and educational accomplishments. Recruiters for law firms almost always expect to see a cover letter with your resume. Using lawyer resume templates with cover letters help you to take care of both aspects of your job search at one time. Your cover letter should introduce who you are, provide a very brief paragraph about why you are right for the job, and encourage the reader to read your resume as well. Traditional law firms with experienced partners typically expect a traditional resume format. Simple and clean lawyer resume templates allow you to add all your relevant information without creating a resume that is too busy for the recruiter to read. 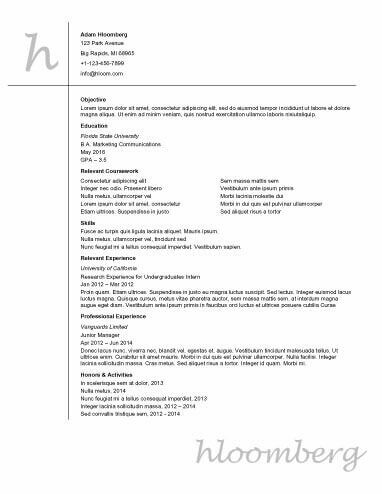 These resumes usually use basic black and white but may add visual interest with headers that double as a way to break content into readable chunks. Modern law firms may prefer visuals over traditional black and white resumes. Infographic resumes allow you to provide information about your education and experience in a creative and colorful yet still well-organized document. You might consider amping it up by providing a chart showing the number of cases you won or creating a table of the awards or other accolades you received in college. Perhaps you want to use modern lawyer resume templates but don't want to create infographics. Modern designs offer the best of both worlds. They use colors, unique fonts, and headers to create distinctive visuals while sticking to the traditional methods for listing your skills, education, and experience. The result is a striking visual without going overboard. Your summary statement should be about three sentences. The first sentence should provide your job title and years of experience, the second should focus on your hard skills, and the third should focus on soft skills or a major accomplishment. Use sentence fragments to keep this section smaller. Focus on what you can provide for the law firm, not what they can provide for you. List your skills in order from most relevant to least relevant to the position. Tweak this section each time you send your resume to personalize it to the position you’re applying for. Use the exact phrases that the job ad used. Those phrases act as keywords and make it more likely that you’ll receive a call.